A few Music City vets posed for this photo during the third quarter of the Middle Tennessee-Georgia Tech football game this year. A fun time was had by all, even though the action on the field was much more intense. 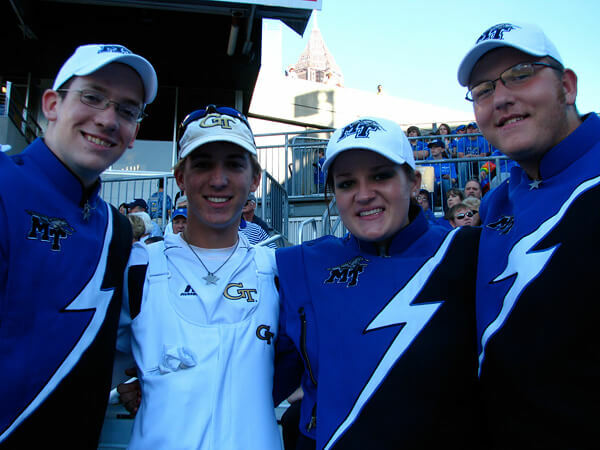 From left to right are Sam M., Thomas B., Allie, D. and Jack B.
Sam was a euphonium player in 2010 and is returning in 2011 as a charter member. Thomas is also a charter member and is returning for his third season on trumpet in 2011. Allie is returning to play mellophone for the second year in 2011. Jack was a rookie trumpet player in 2010.